It might seem obvious, but fishing is not the same as catching fish. Our middle son, Thing 2, loves to fish and he understands that concept. When I asked him what he liked about fishing, he just said it was the casting out and reeling in. He did not say anything about the scenery or the sounds or the smells, but I know he gets it. He understands that fishing is all about the memories – the adventure and the stories told afterward. 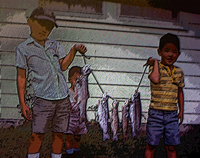 I remember being a kid fishing in Wyoming with Dad and Mom, Grandpa and Grandma, and other relatives. We kids fished some and played in the water some and made too much noise for Grandpa some. I remember wearing the same sort of rubber boots that Thing 2 wore on our recent outing. But when my brother, Russell, and our cousin, Greg, and I wore them, we would sit down in the shallow part of the river, let the boots fill up with water, and then float downstream a little ways with those boots pulling us along. I am sure we figured out the game by accident when one of us fell down trying to get to a small island in the river. Then, we put our poles away on purpose and floated the river for a while. Whenever we were yelling while floating down the river or just not fishing, Grandpa always yelled, “Yakamashi!” at us. That one word in Japanese meant we were being too loud and should be quieter and Grandpa was not happy with us especially since he knew we might quiet down for a bit but get loud again. When we were throwing rocks into the river because we were done fishing for a while, that one word meant to be quiet because we were scaring away the fish. When we were fishing, we were always too loud for Grandpa. It was supposed to be a quiet and tranquil time, so when we got too loud, he got a little upset at us. But I also remember making Grandpa mad because of my fishing skills. One time, I caught a fish that was bigger than his. I never knew that my greatest fishing feat was a cause of great consternation for my Grandpa. My dad told me that Grandpa hated that I caught a fish so much bigger than his that one trip. (If he had told me long ago, I might have rubbed it in a little more instead of just mentioning it every once in a while.) But catching the big fish was not the best part of that particular outing. Or at least not the most memorable for me. What I remember most about that trip was landing that monster trout. I knew it was big when I hooked the fish and was reeling it in. I was extremely excited when I landed it. I did not have a net so I just pulled it up on the grassy bank, but before I could even start to bend down to pull the hook out of its mouth, that rainbow trout did what it had valiantly tried to do while I was reeling it in. It finally spit the hook out. It was on the ground and flapping for dear life to get back into the water and swim away. I dropped my pole and scrambled after it, but the fish had already made it back to the water. I was not about to go back to camp and talk about the one that got away, so I went in after it. Apparently, the fish only had those last few flops left in it because it did not get away. I figure it did not have enough energy for even one swish of its tail because I was able to scoop it up out of the water and back on the bank again. And I was king fisherman that day. We did not have any great stories like that when Thing 2 and I got back from our most recent fishing outing. At least not true ones. We did not really catch and release any great whites (which, of course, do not live in fresh water rivers) or other river monsters. Still, when he told those tales, I knew he got the story part of fishing. Thing 2 also gets the adventure and memory part of fishing. He will not remember all the fish he ever caught or even the ones that got away. Instead he will remember being at the river casting and reeling in. He will remember the people he was with, the ripples on the water, the sounds of the river, the smell of the bait, the feel of the rod and reel in his hands, and the taste of the fish he caught. He will remember that he caught some fish and lost some fish. He will remember the walks in the woods to get to the fishing spots. But mostly, my son will remember that fishing is so much more than catching. He will remember that going fishing is an adventure. An adventure that can, and often does, get better with each retelling.